What a lovely idea! Thank you very much for getting the word out on these, it's always nice to hear about a bit of light shining in this world that seems so overwhelmed by darkness at times. What a wonderful treat it is to have had good conversation through social media and then meet up with her! Love that! Becky sounds like a remarkable woman, and I love their product and what WMYP is doing. It is a shame that some people turn their noses up at "ethical fashion." 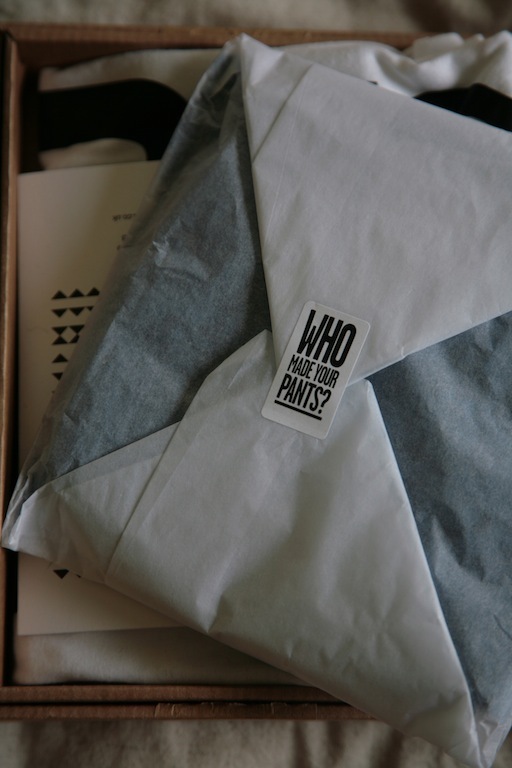 I love companies that do something like this, it's fun to now exactly where (and who) your clothes come from! Another very thought provoking article, and ooh your outfit's great but I'm mostly distracted by your marvellous never ending pins! Haha love how you styled the undies, and that first shot of you. And what a wonderful initiative! Next time I buy underwear, it'll definitely be through there. I'd love to help to keep this running. You are the best spokesperson for this initiative. What wonderful undies. It helps so much to put a name to the product. Let's see you tap dance! Love that very cool outfit, and this pearl collar is absolutely lovely! These are darling underpants made extraordinarily fun as overpants! (and I love the claim that they don't "ride, slip, chafe or go up" the bum) Your hat and dancer legs throw me back to Bob Fosse Broadway shows. And I can almost hear your heels clicking with taps. Becky and her concept for lingerie with human rights are a terrific example of grass roots movements making the world a better place. This is partly why I love purchasing things directly from the craftsman, especially if that craftsman/artist happens to be a friend! It's not charity, but it all goes back directly to the creator. After the Bangladesh building collapse, following the news, seeing images and finding out the death toll had me ending up a sobbing mess. That was when I decided to only buy second hand/vintage clothing unless it was from an ethical brand. While I could often find tights in their unopened packets in charity shops, underwear became a bit of a problem. So thank you so much for introducing me to Who Made Your Pants?. I found out about them from a previous article of yours and recently bought a batch of seconds from them. Who Made Your Pants? is such a genius idea, even the name gets you thinking. I think there should be an extra W there as well, for Women. Absolutely brilliant piece and great photos (I particularly loved the 4th and 6th shots)and my god, your legs are endless!